Look at this beautiful wrapping paper! 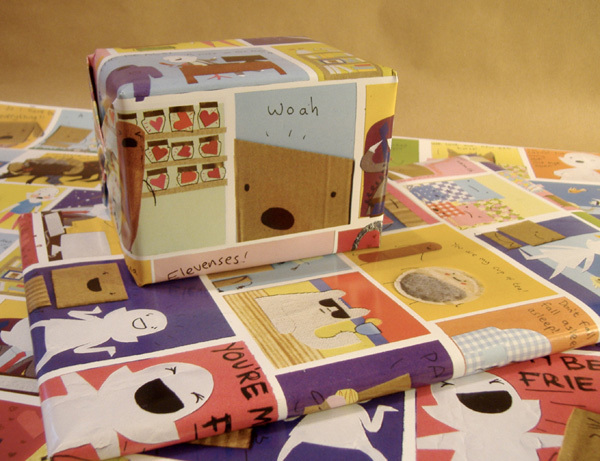 I’ve had this made so that you can wrap all your birthday and Christmas presents in panels from My Cardboard Life comics. If you’re buying presents from my shop, I can even wrap them for you. 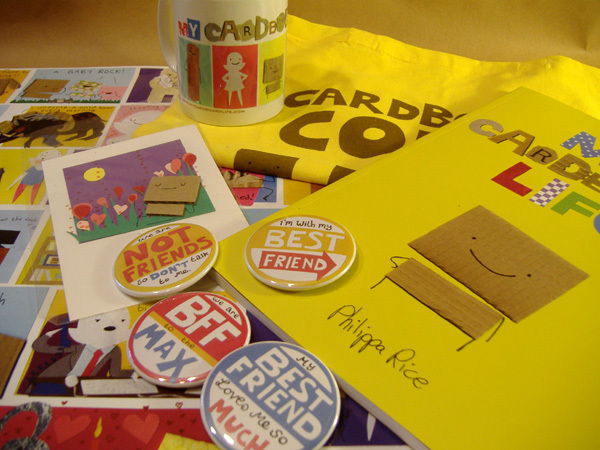 There’s other new things in the shop too so go and have a look around! I notice you don’t draw her faces on until the very end.. what happens if you mess up on the face completely? Would you start it aaaaaall over again, or get the Tipex out? I do get the face wrong sometimes. Usually the glue isn’t dried yet at that point so I can carefully cut the head off and remove it and put a new one in its place. Oh, I hadn’t considered that! That’s a good idea, and I’m glad it doesn’t get ruined entirely. I’ve never tried it on any comics. I have tried it generally and I don’t like it, I never wait long enough for it to dry. Far out, I can’t believe you are able to cut the shapes without drawing the outlines. So much work! Real time was–? I’m all exhausted from just watching that and now I have to go take a nap. Very interesting to watch. I would imagine that I would end up cutting the heck out of my fingertips if I tried to do something like this. Wow, that looks very laborious, well done, I couldn’t do all that!